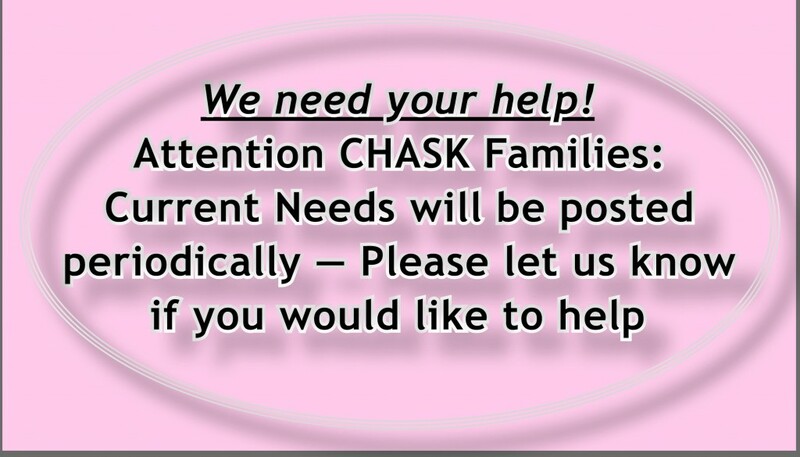 Lots of projects and updates for the CHASK organization! We need your help though — let us know if you feel led by the Lord to support us in this ministry. If you would like to help us with some of the following projects please visit our “donate” page! Re-designing and printing new CHASK brochures. Sending out contact information and CHASK brochures to Crisis-Pregnancy Centers nationwide. Updating our CHASK family profiles, thus providing us with an accurate number of potential-adopting families. Additional staff to facilitate the mail, update the database and research additional resources for birth-and-adopting-families. We are always looking for articles for upcoming issues of the NATHHAN & CHASK News! Would you be interested in contributing an article (any length) on your experience with parenting an older, special-needs child for the Spring/Summer 2013 issue? Please give it some thought. We have for the last few months received a multitude of calls related to homeschooling and parenting older children with special needs — these families are desperate for resources! Honestly, it is difficult to keep up with it all — believe us we know, so that is why we are reaching out to families who are already there, and ask them what they are doing?, what they’ve tried?, what’s worked? and what’s failed? Or, maybe you want to send a letter of encouragement to families who are homeschooling children with special needs or those who are considering adopting kids with special needs. We love to see articles about on these issues as well! If you plan to send something, please let us know in advance so that we can reserve a spot for your piece in the layout. Thank you! Contact Us with your ideas, things you would like to see, your needs and possible submissions!